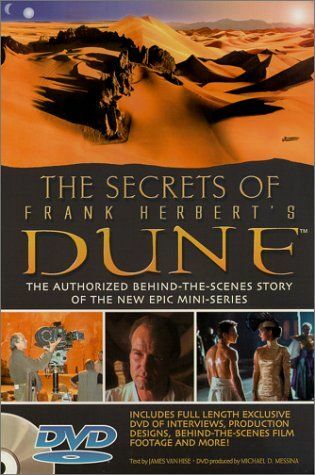 Summary: "The Secrets of Frank Herbert's Dune", complete with a DVD full of interviews, footage, and behind-the-scenes goodies, reveals the how, where, and why of the 6-hour SCI FI Channel miniseries. 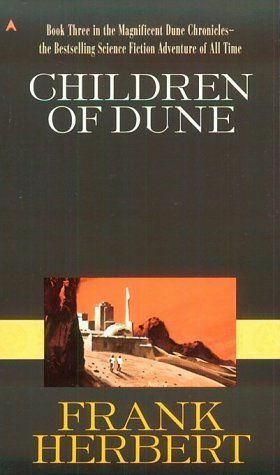 The series, much anticipated by fans of Herbert's novels (and foes of David Lynch's controversial 1984 take on the story), covers the action of the first book, "Dune". With lots of black-and-white photos showing shots from the miniseries as well as never-before-seen cast, crew, and set images, "Secrets" reveals much of the production process, including special effects. The accompanying text enlightens fans about some of the casting and plot decisions, bound to be the subject of debate for years to come. An inset includes color photos of major cast members, production sketches, models, and sets. One of the best chapters in the book is Vittorio Storaro's "Cinematography Ideation of the Film," which reveals his ideas behind camera methods and key shots. The book makes a nice, informative package for anyone interested in how a cable-TV science fiction epic is made, and the DVD is an added bonus. " --Therese Littleton"
Summary: veryone knows Frank Herbert's Dune. 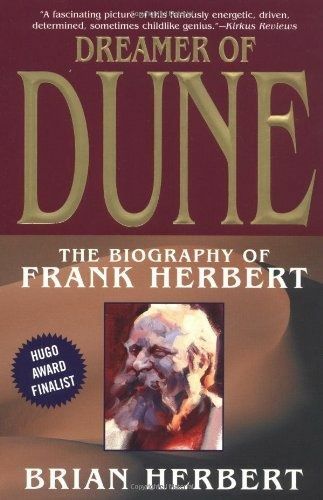 One of the most popular science fiction novels ever written, Dune has become a worldwide phenomenon, winning awards and selling millions of copies. Brian Herbert, Frank's eldest son, tells the provocative story of his father's extraordinary life in this honest and loving chronicle. He has also brought to light all the events in Frank's life that found their way into speculative fiction's greatest epic. 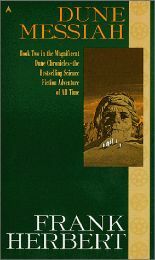 From his early years in Tacoma, Washington, and his education in the Navy and at the University of Washington, Seattle, through the difficult years of trying his hand as a TV cameraman, radio commentator, reporter, and editor of several West Coast newspapers, Frank Herbert worked long and hard before finding success. Brian Herbert writes about his father's life with a truthful intensity that brings every facet of the man's brilliant, and sometimes troubled, genius to full light. Insightful and provocative, containing family photos never published anywhere, this absorbing biography offers Brian Herbert's unique personal perspective on one of the most enigmatic and creative talents of our time. 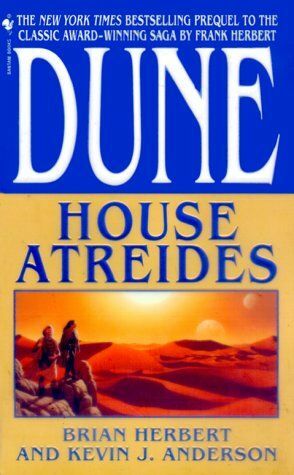 Summary: This Hugo and Nebula Award winner tells the sweeping tale of a desert planet called Arrakis, the focus of an intricate power struggle in a byzantine interstellar empire. Arrakis is the sole source of Melange, the "spice of spices." Melange is necessary for interstellar travel and grants psychic powers and longevity, so whoever controls it wields great influence. "Dune" is one of the most famous science fiction novels ever written, and deservedly so. The setting is elaborate and ornate, the plot labyrinthine, the adventures exciting. Five sequels follow. " --Brooks Peck"
Summary: Paul Atreides, genetically bred and trained to become the leader of his planet, is still subject to human frailties. The second book of the series. My Comments: (Book two of the series. 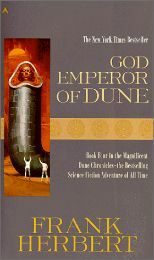 Picks up after Paul Atreides (Muad'dib) has defeated his enemies, and become emperor. Summary: Climactic volume of the Dune trilogy in which an alien society achieves ecological salvation. My Comments: (Book three of the series. The development and ascendancy of Muad'dib's children (Ghanima and Leto II)). Summary: The fourth book about the planet Dune. My Comments: (Book four of the series. Leto II becomes a god through transformation/symbiosis with the sandtrout). Summary: The planet Arrakis is becoming desert again. Lost ones are returning home from the far reaches of space. The great sandworms are dying, and the children of Dunes children awaken from empire as from a dream, wielding the new power of a heresy called love. My Comments: (The fifth book of the series. The life and times of Leto II/The Worm. The Ghola Idaho, and the demise of a god). Summary: Now--the conclusion to Frank Herbert's l3-million-copy epic masterpiece. The desert planet Arrakis, called Dune, has been destroyed, and the heirs to Dune's power, have colonized a green world--and are turning it into a desert, mile by scorched mile. "Impressive...the whole saga will be one of the monuments of modern science fiction." --Chicago Sun Times. TP: Berkley. My Comments: (The sixth and final book of the original series. The Bene Gesserit, and the future of humanity). 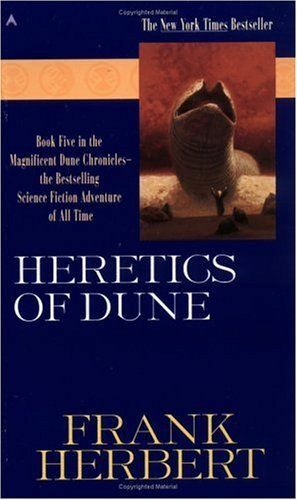 Summary: Acclaimed SF novelist Brian Herbert is the son of "Dune" author Frank Herbert. With his father, Brian wrote "Man of Two Worlds" and later edited "The Notebooks of Frank Herbert's Dune". Kevin J. Anderson has written many bestsellers, alternating original SF with novels set in the "X-Files" and "Star Wars" universes. Together they bring personal commitment and a lifelong knowledge of the Dune Chronicles to this ambitious expansion of a series that transformed SF itself. "Dune: House Atreides" chronicles the early life of Leto Atreides, prince of a minor House in the galactic Imperium. Leto comes to confront the realities of power when House Vernius is betrayed in an imperial plot involving a quest for an artificial substitute to melange, a substance vital to interstellar trade that is found only on the planet Dune. Meanwhile, House Harkonnen schemes to bring Leto into conflict with the Tleilax, and the Bene Gesserit manipulate Baron Harkonnen as part of a plan stretching back 100 generations. In the Imperial palace, treason is afoot, and on Dune itself, planetologist Pardot Kynes embarks on a secret project to transform the desert world into a paradise. 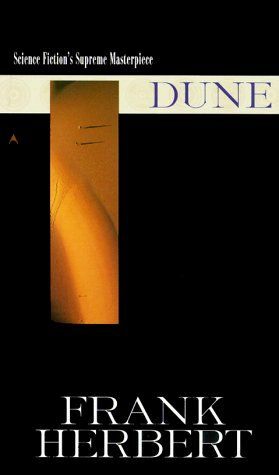 "Dune" remains the bestselling SF novel ever, such that three decades later no prequel can possibly have the same impact. Yet in "House Atreides" the authors have written a compelling, labyrinthine, skillfully imagined extension of the world Frank Herbert created, which ably commands attention for almost 600 pages. It is powerful SF that continues a great tradition, and in itself is a very considerable achievement. " --Gary S. Dalkin, Amazon.co.uk"
My Comments: That's right it's a new Dune Novel. Frank Herbert's son has brought back the series with this first of three planned novels. This book is a prequel to Dune, the first book of the original series. Splendid read. Does his father proud. As rich and intriguing as the original series. Summary: Don't even think about reading "House Harkonnen" without reading its predecessor "Prelude to Dune: House Atreides"; anyone who does so risks sinking in the sands between Frank Herbert's original "Dune" and this new prequel trilogy by Herbert's son, Brian, and Kevin J. Anderson. The purist argument that had Herbert wanted to go backwards he would have done so is, at least in part, negated by the sheer narrative verve, and by the fact that Anderson and Brian Herbert manage to pull some genuine surprises out of this long-running space-opera. 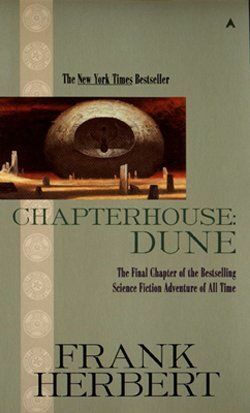 "House Harkonnen" is a massive book, and there are places where it becomes plot heavy, but in following the story of Duke Leto Atreides and the conflicts with House Harkonnen, the authors succeed in spinning a gripping adventure while going off in some unexpected directions. Anderson, who has written many successful "Star Wars" novels, has noted his particular admiration for "The Empire Strikes Back", and his desire to emulate that film's dark take on the genre. In "House Harkonnen" the conflict encompasses the tragedy of nuclear war, is marked by grief and horror, vengeance and torment, and all while the complex intrigues continue to unfold. Everything has its cost. We pay to create our future, we pay for the mistakes of the past. We pay for every change we make--and we pay just as dearly if we refuse to change. Ultimately this is the theme of a compelling game of consequences, choices and responsibility, a study of Leto's growth into power and the price of politics and love. " --Gary S. Dalkin"
My Comments: That's right, another new Dune novel. Frank Herbert's son has brought back the series. This is the second of three planned novels. This book is a prequel to Dune, the first book of the original series. It's been a pleasure absorbing this resurrected majesty of Dune. I'm looking forward to the third book.